What a fun ride Liz Prince and Amanda Kirk's graphic novel Coady and the Creepies turned out to be after beginning with a car accident that left one character a paraplegic and another dead. 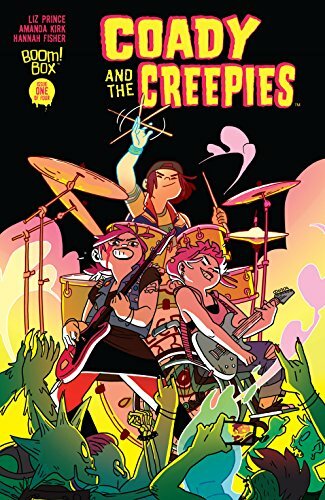 Coady and the Creepies deals with a a punk rock band of triplets who are touring around the country, having supernatural adventures along the way. The characters are well-defined, each with unique and enjoyable personalities. As a fan of punk music, I enjoyed that angle, even though I thought some things could have been handled a little better. Fake rock song lyrics are always cringe-worthy in comic books and they're no exception here. Also, there's a bit about an old punk rocker upset that Coady and the Creepies are girls and that they don't know punk music history. While I do think knowing music history is a good thing, I suppose there is something very punk-attitude about not caring. But there were a lot of classic punk rock bands and singers in real life (X-Ray Spex, Siouxsie and the Banshees, Patti Smith...) so I don't know that it's fair to pretend that females in punk is a new idea. Small complaints though as I really did enjoy the book. Amanda Kirk's jagged line work had a real punk-vibe and the gorgeous colours and thick black lines reminded me of Ted Harrison's art. Ted Harrison isn't, of course, the most punk of artists, but I've always enjoyed him.